Lorna Doone country lies in the Exmoor National Park, just of the south of the A39 running from Porlock to Lynton. However, not far from Bampton in the village of Dulverton (one of the many 'gateways to Exmoor'!) is this fine statue of Lorna Doone standing near the river. The valley itself is very beautiful, wooded, and has Weir Water and Oare Water running along its length - roads are very narrow so even today 'Robbers Bridge' is quite difficult to find. The tiny church at Oare stands in the valley. If you've read R.D. Blackmoore's book, you will know the significance of the small window in the church! 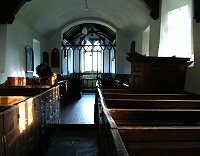 Even if Lorna Doone is not your cup of tea, this little church is certainly worth a visit with its intimate atmosphere and boxed-in pews. In the early spring, like so many other places on Exmoor, the churchyard here has a carpet of snowdrops on and around the graves. The nearby village of Malmsmead is well worth a visit with its lovely bridge and ford. There are also some lovely walks in the area.